Very few companies so entrenched in American culture that songs are written about the products. John Deere is one of those, so iconic that when you say “John Deere green” everyone knows the color…and for most of us, hearing it carries a little jolt of nostalgia. There’s a reason, and it goes far beyond the undeniable reliability of John Deere tractors and implements. John Deere represents a way of life, as familiar to us as sweet tea and red Georgia clay. In 1835, a young journeyman blacksmith named John Deere moved west, from Vermont to Grand Detour, Illinois. The little town was in desperate need of a blacksmith, and he soon had all the business he could handle. It wasn’t long before one of the biggest issues facing the local farmers became apparent. The settlers had migrated from the east bringing their cast iron plows with them. While the heavy plows worked perfectly in the lightweight, sandy soil in the east, they were difficult to handle in the heavy, sticky Midwestern soil. Hearing about how the farmers struggled to get their fields prepared, stopping every few minutes to scrape their plows clean gave Deere an idea. In 1837, he took a broken sawblade and reshaped it into a highly polished steel moldboard plow. He tested it in the fields belonging to Lewis Crandall, a farmer who lived just outside Grand Detour. It worked just as envisioned, slicing clean and straight, with the rich, loamy earth sliding off the lightweight plow. A new business was born, one that would revolutionize farming and launch an American icon. John Deere was a savvy young businessman. Instead of fulfilling plow orders as they came to him, he began producing them in quantity, selling more and more as word spread of the miraculous “self-polishers.” In 1848, he opened a factory in the port city of Moline, Illinois, where he could ship his products far and wide by boat to settlements along the Mississippi River. By now, he’d gone from hammering out his first plow to producing 1,000 plows per year. John Deere never stopped innovating. When he died in 1907, Deere & Company was manufacturing a wide range of farm implements in addition to the original plow. But it wasn’t until March 14, 1918, under the direction of company president William Butterworth, that Deere’s company bought the Waterloo Gasoline Engine Company and started building the tractors we know and love. Wondering about the familiar tagline? In 1971, it was penned by a copywriter named Bob Wright who was working on a campaign for the John Deere snowmobile line. Even when the company stopped making snowmobiles in 1982, the slogan remained so popular the company kept using it. They tried other slogans, but none of them had the same brand impact. John Deere has has made minor changes to its leaping deer logo over time, but its been fundamentally the same for over 155 years. Just about a century ago, the first Waterloo Boy tractors rolled off the line painted in John Deere distinctive green with yellow trim. In 2012, Deere & Company celebrated 175 years in business. Today, the tiny business started by a journeyman blacksmith with a vision is a Fortune 500 company worth more than $65.8 billion. John Deere tractors are sold all over the world. Globally, Deere & Company currently employs about 67,000 people, and about half of them are in the US and Canada. 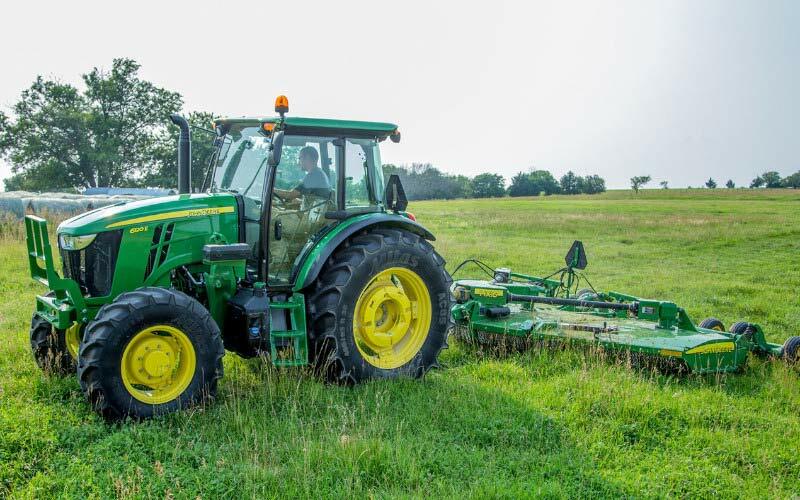 Most of Deere & Company’s revenue – about 70% – is generated by its agriculture and turf division, the part of the company that makes tractors, attachments, harvesters, and other farm and lawn products. John Deere’s other agriculture and turf brands include Frontier, Green Systems, SABO, which is sold in Europe and Benye, which is sold in China. 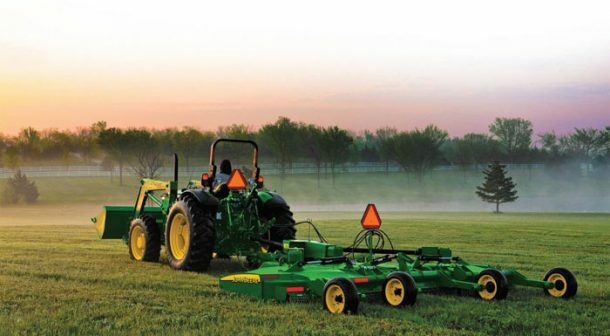 John Deere’s construction and forestry division produces another 20% of total revenues. This division cranks out things like bulldozers, backhoes, and skid-steer loaders. The remaining company revenue is generated by their in-house financial services, which offer credit to John Deere dealers and wholesalers. Late in 2017, Deere & Company acquired Blue River Technology, a Sunnyvale, California company that designs and integrates artificial intelligence technology for agriculture. Agriculture technology enables exact watering and herbicide application to help farmers minimize costs and maximize yield. No doubt the company continues to lead the industry with new innovation in technology. My Dad had one of these and at times it was his daily driver, used in winter to supplement his income as a plow vehicle, plow was an two way plow up and down, when he needed it angled that was my job. many hours of plowing and riding in that jeep. Long gone, he sold it and got a jeep pick up with a four way fisher Plow when I left for the service.